In IPv4 we had arp, to facilitate layer 2 communication. 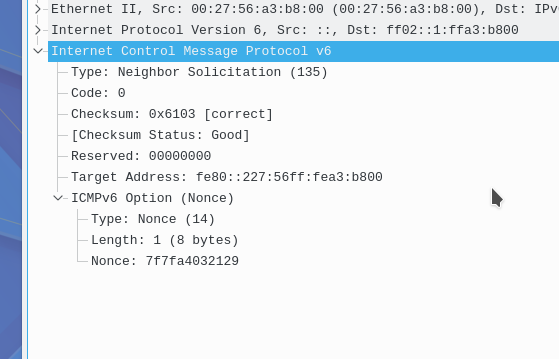 In IPv6 we have ICMPv6 neighbor discovery (ND). ND uses 5 ICMPv6 messages. Duplicate address detection or DAD is done by the neighbor solicitation message. 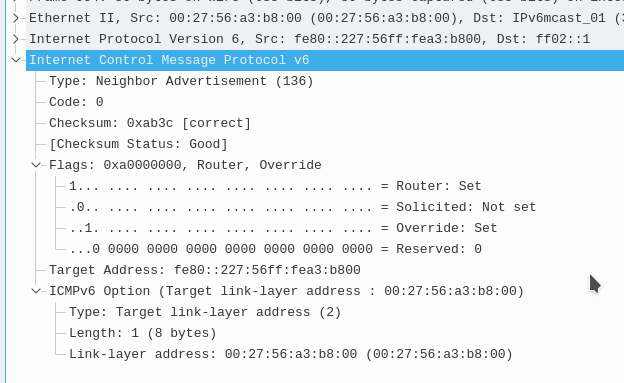 When a host configures itself with any address, whether it be link local or global via SLAAC, it will use a neighbor solicitation message to check if the address is already in use. The message sourced from when doing DAD is “::”, this address is also called the unspecified address. The router advertisement features 11 fields, some which have more sub fields. Router advertisements are also immediately sent when a router solicitation message is seen. The router solicitation message is sent when a host or interface first comes on the network. It is used so that they do not have to wait 200 sec for the next router advertisement. Instead they just request one so they can configure themselves quickly. This packet is very similar to the ICMP type 5 code 1 from IPv4.